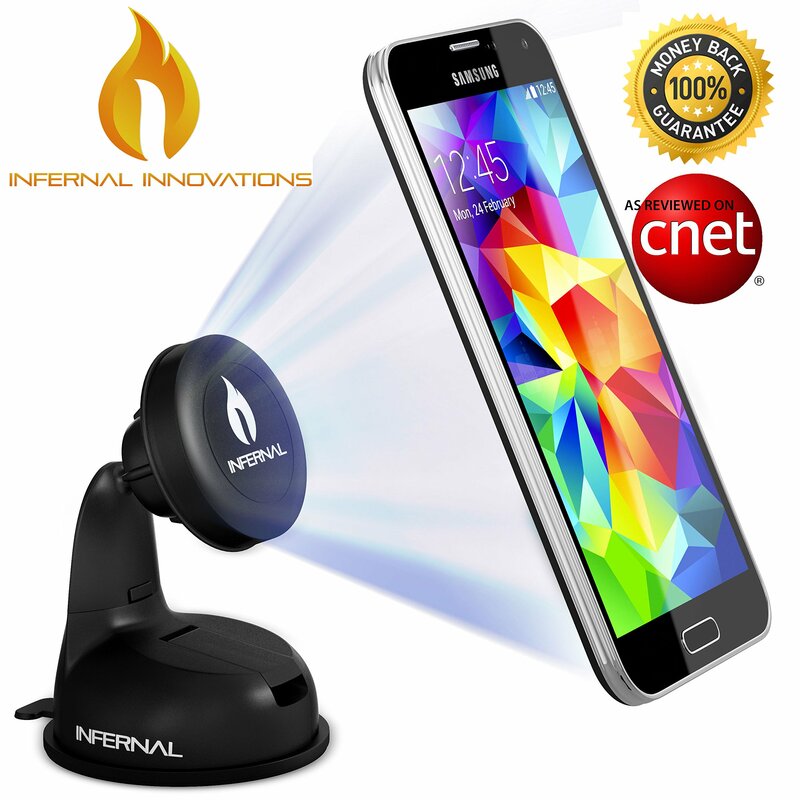 Home › Infernal Innovations Magnetic Phone Mount With 75Mm Adhesive Disk For Samsung..
Infernal Innovations Magnetic Phone Mount With 75Mm Adhesive Disk For Samsung.. EXTREME SUCTION This baby really sticks! Industrial strength suction cup gel pad is compatible with almost any flat surface and provides quick, precision installation. Snap on to a windshield, dashboard, office desk, kitchen counter, plane or even a golf cart! 360 ROTATION & SIDE-TO-SIDE SWIVEL Find the perfect angle when following the GPS or for handsfree talking. Top is reversible so you can lean a larger phablet against the base for additional stability. No other type of phone holder cradle allows this useful feature! PROTECTS YOUR PHONE This cellphone holder's rubberized head works perfectly with the quad magnet array making your phone protected & stable! 4 strong neodymium magnets enable one-touch mounting technology and a gentle but firm support. BONUS GIFT Since no suction cup sticks to 100% of dashboards, 75mm adhesive disc included(8.99$ value) in case you have a non smooth dash. Risk-free 5 year warranty. BUY 2 OR MORE MOUNTS AND GET FREE SHIPPING! YOUR SEARCH FOR THE PERFECT PHONE MOUNT IS FINALLY OVER! Place it on a flat surface and flip the lever on the base to activate the suction. Now take out your smartphone and follow the easy instructions for installing the metal plate on the phone or in your case. Hover the phone close to the mount and PRESTO! Snaps right on thanks to the synchronous quad magnetic array in the mount that makes the magic happen! On top of that, we offer a better than money-back guaratee. Try the Magnetic Mount for 60 days. If you don't feel you got every penny's worth of your investment today, we'll give you a refund! SO ORDER NOW AND WHEN YOU DO, CONSIDER GETTING TWO... ONE FOR YOU AND ONE FOR YOUR VERY BEST FRIEND!